Scarlett will train for the next 14 to 28 months before going out on her first mission. BAKERSFIELD, Calif. — The Kern County Sheriff's Office has added another partner to their search and rescue team! Scarlett is an eight week old bloodhound. 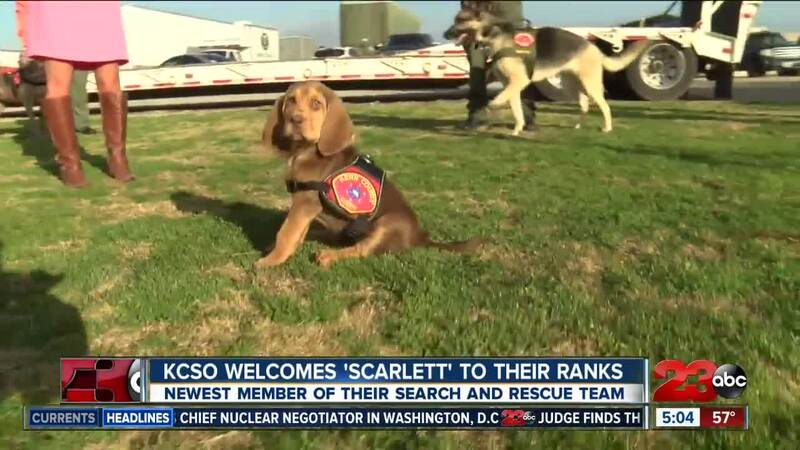 According to KCSO, she comes all the way from Texas and is in the early stages of her training to join the team of six search and rescue dogs. Each handler takes on the financial responsibility for their dog, unless the dog is hurt while performing a mission. Scarlett will learn to use her nose and track the scents of missing people in Kern County. She will go through training for 14 to 28 months before taking her first mission. Search and Rescue officials say there were 85 to 87 missions in 2018. They say once Scarlett is ready to join her fellow furry friends, she will save lives in Kern County.